, a very eminent, pious, and learned English prelate, was born July 1, 1574, in Bristow-park, within the parish of Ashby de la Zouch, in Leicestershire. His father was an officer to Henry earl of Huntingdon, then president of the North, and under him had the government of that town, which was the chief seat of the earldom. His mother was of the family of the Bembridge’s, and according to his own account, a woman of great piety. His parents had twelve children, and therefore, although disposed to bring up Joseph for the church, were inclined from motives of oeconomy to confine his education to the care of a private tutor. 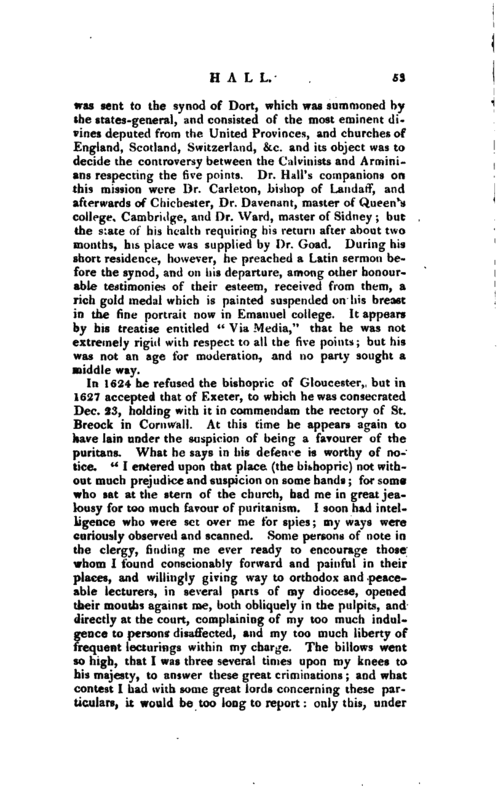 But Mr. Gilby, fellow of Emanuel college, hearing of this design, represented its disadvantages in such a manner to Mr. Hall’s eldest son, that the latter importuned his father that Joseph might be sent to the university, and generously offered to sacrifice part of his | inheritance, rather than prevent his brother from enjoying the advantages of academical education. His father, struck with this mark of brotherly affection, declared that, whatever it might cost him, Joseph should be sent to the university. 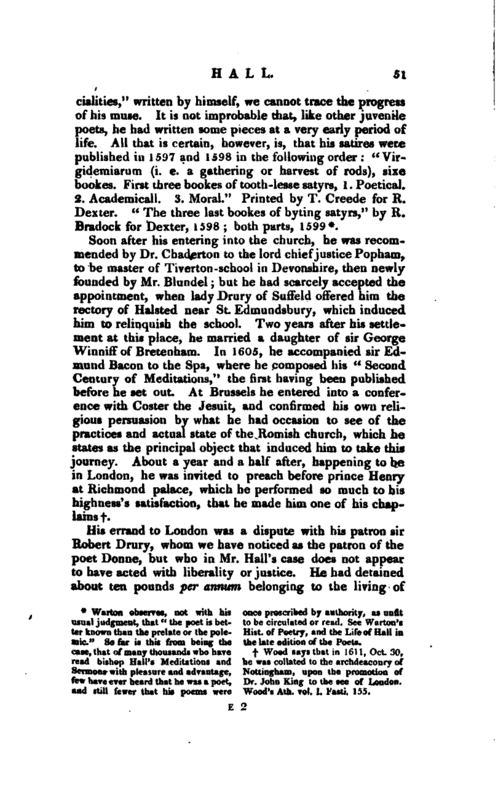 He was accordingly removed to Cambridge at the age of fifteen, and admitted of Ernanuel college, of which he was chosen scholar, and took the degree of bachelor of arts. His residence, however, was not without its difficulties. In 1591, as his expences began to be felt in so large a family, he was recalled to fill the office of schoolmaster at Ashby de la Zouch, and would have been prevented from ever returning to college, had not Mr. Edmund Sleigh of Derby, an uncle by marriage, offered to defray half the expences of his residence at Cambridge, until he should attain the degree of master of arts; and this he liberally performed. Another difficulty still presented itself. In 1395, his rholar&hip exnir*^ a^rj +h Q statutes of the college permitting only one person of a county to become fellow, he was about to leave the university a second time, when the earl of Huntingdon prevailed on his countryman and tutor, Mr. Gilby, to resign his fellowship, on promise of being made his lordship’s chaplain, and receiving higher promotion Mr. Gilby consented, and the days of examination for the fellowship were appointed; but before two of the three days of trial had expired, news was brought of the sudden death of the earl, by which event Mr. Gilby was likely to be deprived of the conditions on which he resigned. 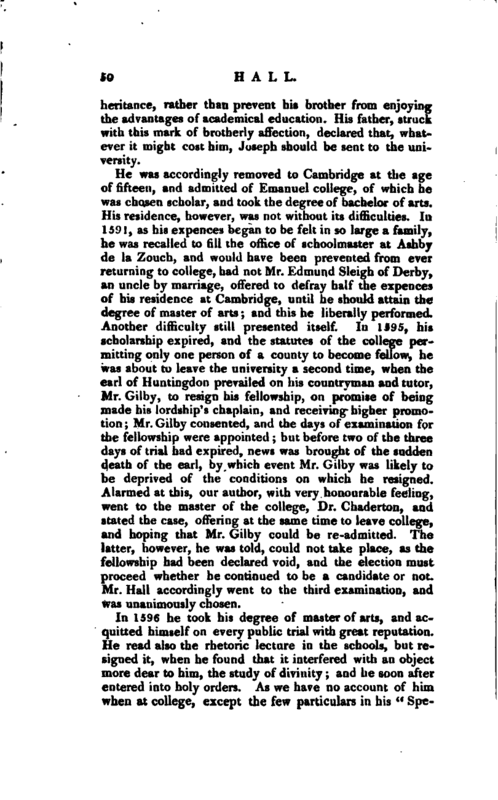 Alarmed at this, our author, with very honourable feeling, went to the master of the college, Dr. Chaderton, and stated the case, offering at the same time to leave college, and hoping that Mr. Gilby could be re-admitted. The latter, however, he was told, could not take place, as the fellowship had been declared void, and the election must proceed whether he continued to be a candidate or not. Mr. Hall accordingly went to the third examination, and was unanimously chosen. In 1596 he took his degree of master of arte, and acquitted himself on every public trial with great reputation. He read also the rhetoric lecture in the schools, but resigned it, when he found that it interfered with an object more dear to him, the study of divinity; and he soon after entered into holy orders. As we have no account of him when at college, except the few particulars in his “| Specialities,” written by himself, we cannot trace the progress of his muse. It is not improbable that, like other juvenile poets, he had written some pieces at a very early period of life. All that is certain, however, is, that his satires were published in 1597 and 1598 in the following order: “Virgidemiarurn (i. e. a gathering or harvest of rods), sixe bookes. First three bookes of tooth-lesse satyrs, 1. Poetical. 2. Academical!. 3. Moral.” Printed by T. Creede for R. Dexter. “The three last bookes of byting satyrs,” by R. Bradock for Dexter, 1598; both parts, 1599*. and still fewer that his poems were Wood’s Ath. vpl. I. Fasti. 155. | Halsted, notwithstanding the remonstrances of the incumbent, who assured him that with such a deduction it was an incompetent maintenance, and that he had been obliged to write books in order to be able to buy some. These arguments not prevailing, he was about to resign Halsted, when Edward lord Denny, afterwards earl of Norwich, gave him the donative of Waltham Holy Cross in Essex. About the same time (1612) he took the degree of doctor in divinity. He now returned home, and resumed his professional duties, happy in having overcome his perplexities, an in the acquisition of a new patron, whom he valued so highly as to refuse the prince’s invitation to reside near his person, and in the road to higher preferment. 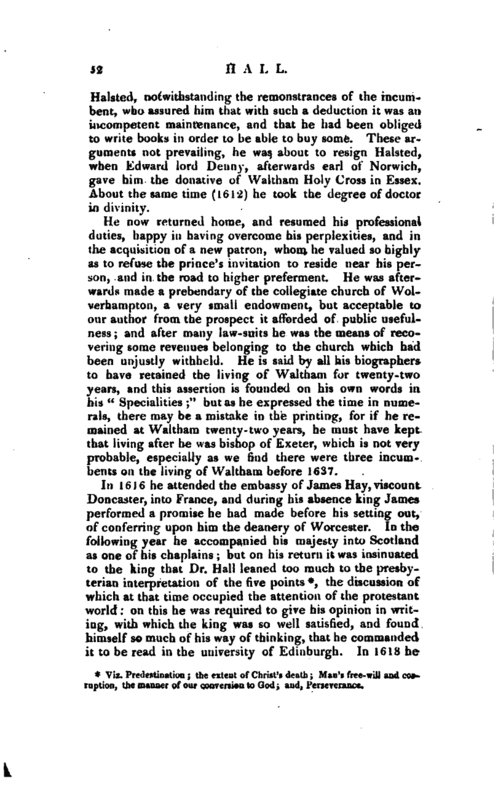 He was afterwards made a prebendary of the collegiate church of Wolverhampton, a very small endowment, but acceptable to our author from the prospect it afforded of public usefulness; and after many law-suits he was the means of recovering some revenues belonging to the church which had been unjustly withheld. 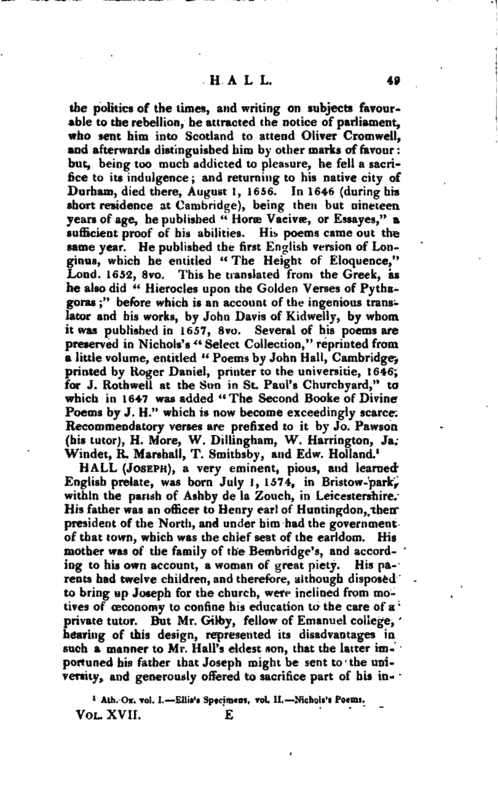 He is said by all his biographers to have retained the living of Waltham for twenty-two years, and this assertion is founded on his own words in his “Specialities;” but as he expressed the time in numerals, there may be a mistake in the printing, for if he remained at Waltham twenty -two years, he must have kept that living after he was bishop of Exeter, which is not very probable, especially as we find there were three incumbents on the living of Waltham before 1637. Viz. Predestination; the extent of Christ’s death; Man’s free-will and corruption, the manner of our conversion, to God; and, Perseverance. | was sent to the synod of Dort, which was summoned by the states-general, and consisted of the most eminent divines deputed from the United Provinces, and churches of England, Scotland, Switzerland, &c. and its objectwas to decide the controversy between the Calvinists and Arminians respecting the five points. Dr. Hairs companions on this mission were Dr. Carleton, bishop of Landaff, and afterwards of Chichester, Dr. Davenant, master of Queen’s college, Cambridge, and Dr. Ward, master of Sidney; but the state of his health requiring his return after about two months, his place was supplied by Dr. Goad. During his short residence, however, he preached a Latin sermon before the synod, and on his departure, among other honourable testimonies of their esteem, received from them, a rich gold medal which is painted suspended on his breast in the fine portrait now in Emanuel college. It appears by his treatise entitled “Via Media,” that he was not extremely rigid with respect to all the five points; but his was not an age for moderation, and no party sought a middle way. It must be allowed that the religious principles which he inculcated from the pulpit and the press, were much more consonant to what the puritans maintained, than the lax Arminianism for which Laud contended, but at the same time bishop Hall’s zeal for episcopacy was not inferior to that of any supporter of the church. Few men, indeed, wrote more, or suffered more, in the cause. 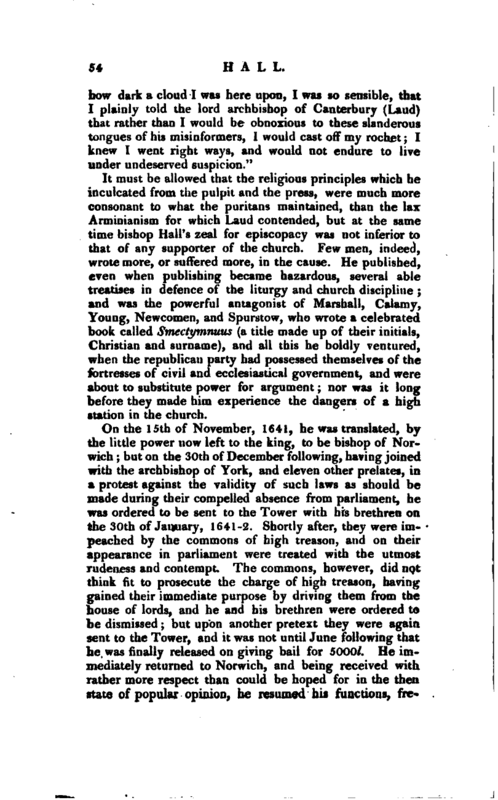 He published, even when publishing became hazardous, several able treatises in defence of the liturgy and church discipline; and was the powerful antagonist of Marshall, Calamy, Young, Newcomen, and Spurstow, who wrote a celebrated book called Smectymnuus (a title made up of their initials, Christian and surname), and all this he boldly ventured, when the republican party had possessed themselves of the fortresses of civil and ecclesiastical government, and were about to substitute power for argument; nor was it long before they made him experience the dangers of a high station in the church. On the 15th of November, 1641, he was translated, by the little power now left to the king, to be bishop of Norwich; but on the 30th of December following, having joined with the archbishop of York, and eleven other prelates, in a protest against the validity of such laws as should be made during their compelled absence from parliament, he was ordered to be sent to the Tower with his brethren on the 30th of January, 1641-2. Shortly after, they were impeached by the commons of high treason, and on their appearance in parliament were treated with the utmost rudeness and contempt. The commons, however, did not think fit to prosecute the charge of high treason, having gained their immediate purpose by driving them from the house of lords, and he and his brethren were ordered to be dismissed; but upon another pretext they were again sent to the Tower, and it was not until June following that he was finally released on giving bail for 5000l. 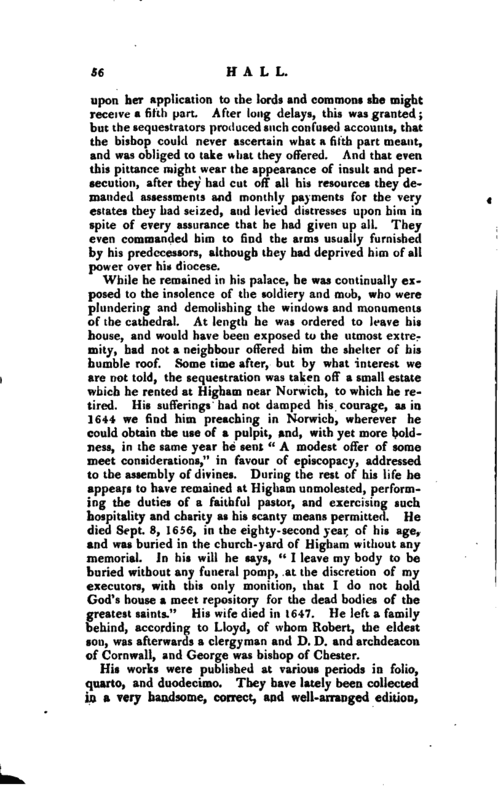 He immediately returned to Norwich, and being received with rather more respect than could be hoped for in the then state of popular opinion, he resumed his functions, | frequently preaching, as was his custom, to crowded audiences, and enjoying the forbearance of the predominant party till the beginning of April, 1643, when the destruction of the church could no longer be delayed. About this time, the ordinance for sequestering notorious delinquents having passed, and our prelate being included by name, a distinction which his writings and his popularity had merited, all his rents were stopped, even the half-year then due; and a few days after, the sequestrators entered his palace, and began the work of devastation with unfeeling brutality, seizing at the same time all his property real and personal. Some notion of their proceedings may be formed from his own brief account. 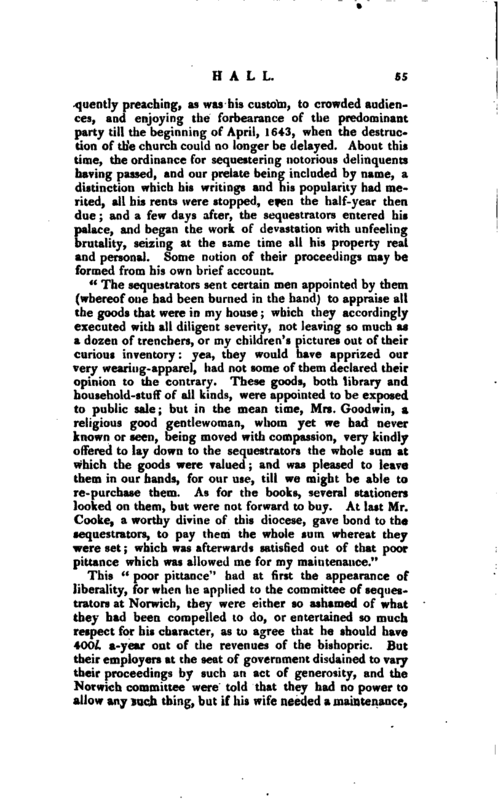 This “poor pittance” had at first the appearance of liberality, for when he applied to the committee of sequestrators at Norwich, they were either so ashamed of what they had been compelled to do, or entertained so much respect for his character, as to agree that he should have 400l. a-year out of the revenues of the bishopric. But their employers at the seat of government disdained to vary their proceedings by such an act of generosity, and the Norwich committee were told that they had no power to allow any such thing, but if his wife needed a maintenance. | upon her application to the lords and commons she might receive a fifth part. After long delays, this was granted; but the sequestrators produced such confused accounts, that the bishop could never ascertain what a fifth part meant, and was obliged to take what they offered. And that even this pittance might wear the appearance of insult and persecution, after they had cut off all his resources they demanded assessments and monthly payments for the very estates they had seized, and levied distresses upon him in spite of every assurance that he had given up all. They even commanded him to find the arms usually furnished by his predecessors, although they had deprived him of all power over his diocese. While he remained in his palace, he was continually exposed to the insolence of the soldiery and mob, who were plundering and demolishing the windows and monuments of the cathedral. At length he was ordered to leave his house, and would have been exposed to the utmost extremity, had not a neighbour offered him the shelter of his humble roof. Some time after, but by what interest we are not told, the sequestration was taken off a small estate which he rented at Higham near Norwich, to which he retired. His sufferings had not damped his courage, as in 1644 we find him preaching in Norwich, wherever he could obtain the use of a pulpit, and, with yet more boldness, in the same year he sent “A modest offer of some meet considerations,” in favour of episcopacy, addressed to the assembly of divines. During the rest of his life he appears to have remained at Higham unmolested, performing the duties of a faithful pastor, and exercising such hospitality and charity as his scanty means permitted. He died Sept. 8, 1656, in the eighty-second year of his age, and was buried in the church-yard of Higham without any memorial. In his will he says, “I leave my body to be buried without any funeral pomp, at the discretion of my executors, with this only monition, that I do not hold God’s house a meet repository for the dead bodies of the greatest saints.” His wife died in 1647. 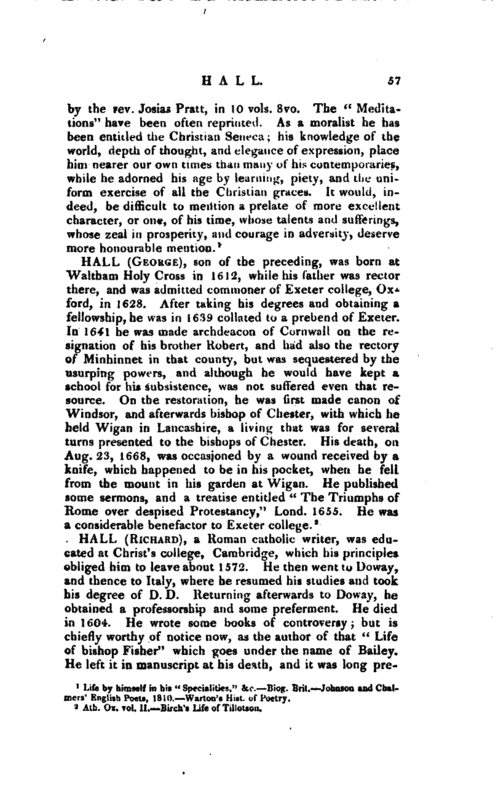 He left a family behind, according to Lloyd, of whom Robert, the eldest son, was afterwards a clergyman and D. D. and archdeacon of Cornwall, and George was bishop of Chester. Life by himself in his “Specialities,” &c. Biog. Brit. Johnson and Chalmers’ English Poets, 1810. Warton’s Hist, of Poetry.